Contents: A doll, a carriage and a horse. Inspired by a strawberry, the open-air carriage is so pretty -- a crown acts as a leaf on the pink top, green scrollwork keeps it airy, the pink doors are decorated with bows and the purple wheels swirl as they roll. Swing open the door to let Barbie princess doll hop in, place her in the seat and pull or push to get your stories started. Barbie princess doll can invite a friend -- the carriage comfortably seats two dolls for even more riding fun. The white unicorn is ready to lead imaginations anywhere with a pink horn and purple mane and tail. A colourful bridle and reins connect it to the fantastical carriage. Barbie Dreamtopia Sweetville carriage and unicorn is one sweet ride for Barbie princess doll. 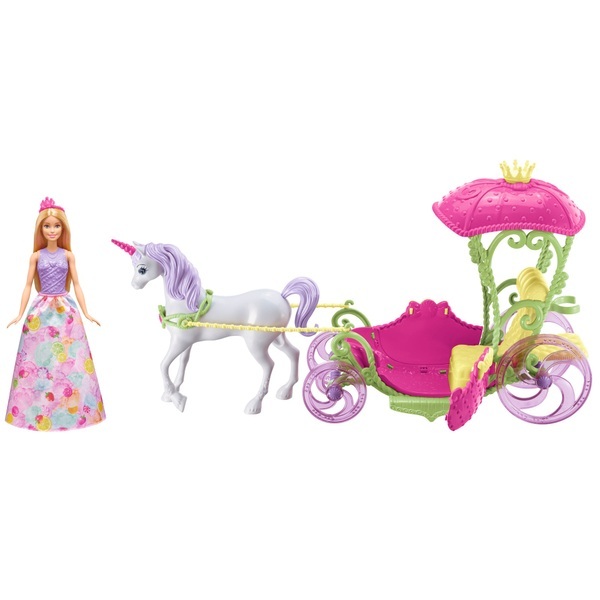 This Barbie Dreamtopia Sweetville carriage and unicorn is one sweet ride for Barbie princess doll. Swing open the door to let her hop in and ride in royal style! Inspired by a strawberry, the open-air carriage is so pretty -- a crown acts as a leaf on the pink top, green scrollwork keeps it airy, the pink doors are decorated with bows and the purple wheels swirl as they roll. Simply place Barbie doll in the seat, and pull or push to get your stories started. Barbie princess doll can invite a friend -- the carriage comfortably seats two for even more riding fun. The white unicorn is ready to lead imaginations anywhere with a pink horn and purple mane and tail. A bridle and reins connect it to the fantastical carriage. Barbie princess doll looks so sweet with a pink candy-decorated bodice, a removable skirt with colourful fruit print, matching shoes and a pink tiara. Young imaginations will love letting their dreams ride into Barbie Dreamtopia's Sweetville Kingdom and beyond! Includesarbie doll wearing fashions and accessories, carriage with rolling wheels, unicorn and bridle and reins. Colours and decorations may vary.